Martha Graham, leader of the modern American dance movement, pioneered a new way of moving which evolved from the meaning of the dance. Sweeping aside conventional standards of beauty, grace, rhythm and linear design, she created a fresh, earthy vocabulary which reflected her own era. Using the ground extensively and developing the “contraction”, a movement whereby the torso visibly showed the effort of breathing, Martha broke the classical mold of ballet, which had sought to conceal effort. Her Aquarius Midheaven alerts us to her revolutionary role in ushering in a new era for dance. Yet her horoscope also suggests that she searched for a spiritual perspective from the past, drawing on philosophy and occult beliefs to initiate, dramatize, and communicate through visceral movement to the public. In one of her many essays she wrote, “Throughout time dance has not changed in one essential function. The function of dance is communication. The responsibility that dance fulfil its function belongs to us who are dancing today” (Morrison Brown, p. 50). Martha Graham accepted this responsibility wholeheartedly (Saturn peregrine pushing into the 6th House), furthering and solidifying the work begun by Isadora Duncan, “to re-establish dancing among the major arts, as ‘the servitor of religious and intellectual purposes’” (De Mille, p. 121). With the Sun in Taurus and the Moon in Leo, we feel the tenacity of her fixed sign blend to establish something of significance. Her core energies to build and maintain will be channeled into dramatic behaviors to be loved, honored and respected. Her Sun/Moon Midpoint is at the Aries Point (00 Cancer), suggesting that this blend of luminaries will press to come forward strongly in the life, to reach out to others. Like Saturn, the earthy Taurus Sun is peregrine (making no Ptolemaic aspect with another body in the horoscope), calling special attention to the 4th House, the place of new beginnings, the home, and rootedness. It was Ted Shawn of Denishawn (The Ruth St. Denis School of Dancing and Related Arts) who first recognized Martha’s talents: “You are not a lyrical dancer. Your gift is like a mustard seed. It will grow into a sturdy oak with deep roots” (quoted in Stodelle). 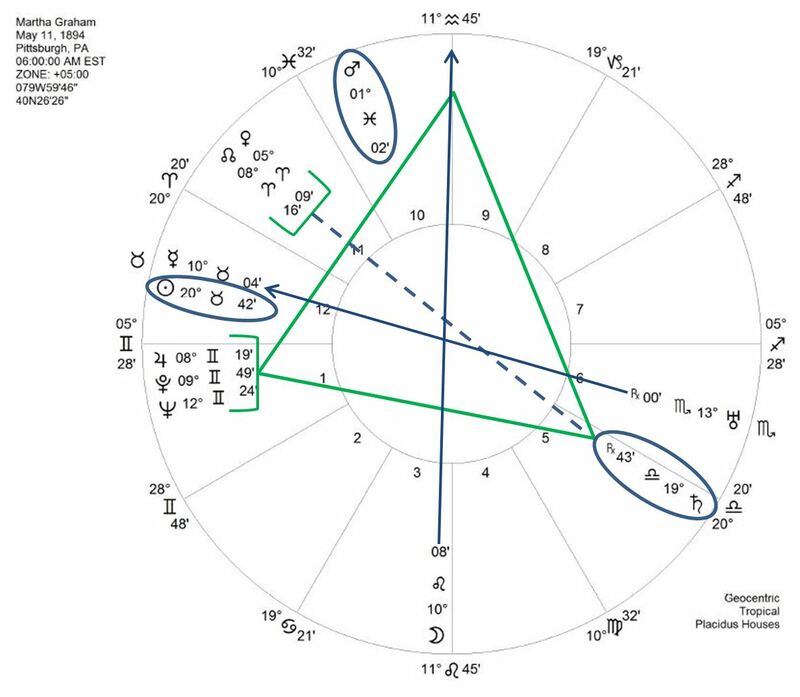 With the angular Leo Moon ruling the 3rd House of communications and movement, in a highly charged T-Square with Mercury-Uranus, and reaching up to the Midheaven, we see the repetitive insistence on being recognized – for the communication of movement. Mars is in introverted, mystical Pisces but occupies the angular 10th House and is also peregrine, calling attention to the 12th House, which it rules. Mars empowers the Ascendant and is part of the formidable Midpoint Picture Saturn=Mars/Pluto – “Hard, hard work; extraordinary discipline is needed and usually prevails” (Tyl). Further emphasis is placed on the 12th House: it is co-ruled by fiery Venus, itself receiving a quindecile (165 degree aspect) from Saturn and is home to both the Sun and Mercury. Martha was so much more than a dancer and choreographer, as her horoscope promises; she plumbed the depths of ancient mythology and eschatology. Her Notebooks bear witness to her constant delving into the ancient past for humanity’s truth, her spiritual quest to restore dance as a way to communicate our inner life. The Air Grand Trine, which includes the Midheaven, suggests her intellectual self-sufficiency as well as the profound inspiration which she would share with the world. Her horoscope sings of her tireless pursuit to be, in her own words, “an athlete for God” (the Gemini stellium of Jupiter-Neptune-Pluto embracing the Ascendant and trine to the Midheaven). Martha, we remember you. 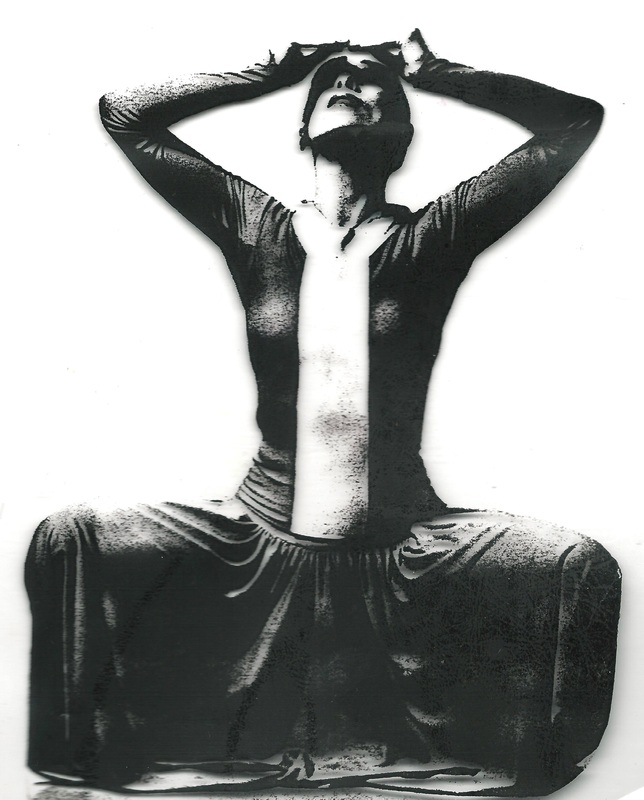 Martha Graham: born May 11, 1894 at 6am EST in Pittsburgh, Pennsylvania; died April 1, 1991 in New York City at age 96. © Catherine Goshen. No part of this article may be reproduced without the author’s written permission. Written on the solar eclipse of April 29, 2014, with the New Moon conjunct Martha’s Mercury.